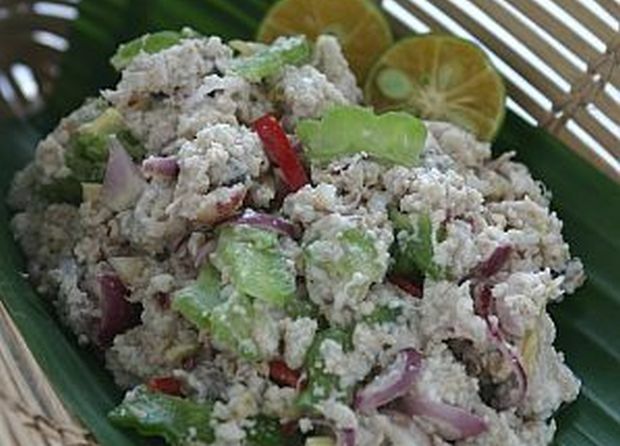 Combine the fish slices with the lime juice and salt in a mixing bowl. Using your fingers, work the mixture well. Set aside to marinate for 10 minutes, preferrably in the refrigerator. Add the rest of the ingredients. Toss well and serve. For more food and wine stories and recipes, pick up the latest issue of [Flavours (May – June 2004)], Malaysia’s premier food magazine, available at major bookstores and newsstands or email cir.ccu@thestar.com.my for subscription details.